Babi guling, roasted pig, is a typical Balinese food, a well-liked. It feels good and tasty for most people who love it. Restaurants a babi guling very much found in Bali, at a cheap price. 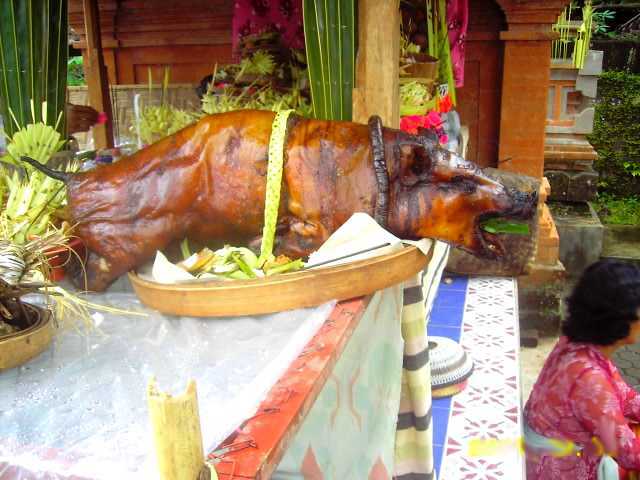 Roasted pig is usually created when a Hindu religious ceremony in Bali. Created as a destination gratitude and thanks to God for all the blessings and grace of God. God does not eat roasted pig, but that's how the Balinese express his gratitude to God. Pigs used is aged young pigs. In order for the meat tender and juicy when eaten. Coupled with Balinese food seasonings. However, if these ingredients eaten by a person not accustomed to eating, it would suffer an upset stomach. Because the flavor is very spicy.